Manchester City boss Manuel Pellegrini has played down the importance of Saturday's top-of-the-table Premier League match with Leicester. The Foxes could go six points clear of second-place City with victory at Etihad stadium. Pellegrini sees no reason why Leicester cannot maintain their impressive form, but does not believe Saturday's game will be decisive in the title race. "It isn't the biggest game of the season so far," he said. "The Premier League doesn't finish here. There are a lot of points to fight for." Pellegrini announced on Monday that he will leave the club at the end of the season, with Pep Guardiola replacing him in the summer. The 62-year-old joked on Friday that he decided to make his decision public "because he was bored". However, he stressed that he felt it was important to have the matter out in the open, so that everyone at the club can concentrate on the remainder of the season. 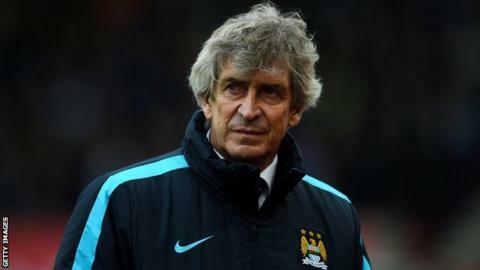 "It is important for everyone to know I knew what was happening and nothing was happening behind my back," said Pellegrini. "This is the last time I talk about that. We must concentrate on this season. I am not talking about the future. Ask me about the team and the game." Pellegrini is attempting to lead Manchester City to four trophies - Premier League, Champions League, FA Cup and League Cup - in his final season at the club. The Blues face Chelsea in the fifth round of the FA Cup later this month, with the game currently scheduled for Saturday, 20 February. However, Pellegrini could play a weakened side if the game is moved to the following day. "If we play against Chelsea on Sunday it won't be a normal team," he said. "It will be a young team. I don't see why we can't play on Saturday. Logically it would be Saturday. I must do what I think is better for the club, which is Champions League." City defender Vincent Kompany could potentially feature in that game, with Pellegrini confirming his captain is expected to return to full training next week. The defender has managed just nine minutes of football in three months after straining his calf on his comeback against Sunderland on Boxing Day. "I hope after another week, Vincent will be back working with the squad fully," he said. "It's important now for Vincent to start playing again as we have just 14 senior players. That's not so many for so many games." Finally, Guardiola's first pre-season with Manchester City will involve a tour to China after the club confirmed they will play in the International Champions Cup.